I’m actually listening to Natasha Bedingfield’s song ”Pocket full of sunshine” .This post kinda mirrors that song. This look is my girly take on the skater skirt.Check out this post for the preppy look. I wore a plain yellow V-neck tee,white skater skirt with black polka dots, my newest faves…light blue pumps and a colour-blocked neck piece. 3. 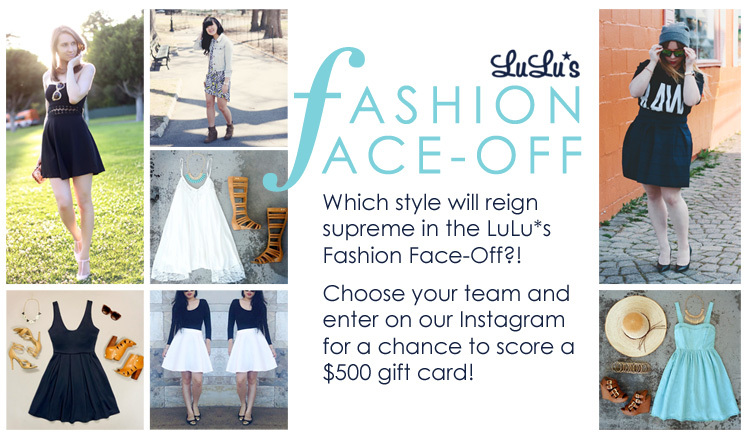 Upload your original photo on Instagram with the hashtag #lulusfashionfaceoff as well as your team’s hashtag. Remember, your profile must be public to be entered! One winner will be selected every Friday at 5pm PST and announced via the LuLu*s Instagram! Contest ends on May 9th, so you’ve got plenty of time to get in on the action! In other news,I’m going on Vacay tomorrow.What will you be doing this easter? Previous Article ARE YOU GUILTY OF THESE BAD FASHION HABITS? i soo love those shoes!!!! Details on where to get similar?? You always look amazing!!!!!!!!!!! I got mine in town. I was at Backyard Shoez in Westlands and saw some similar gorgeous ones! You should definitely check em out. The neck piece is soo cute!! And the shoes too!! I love your look.